Here's how I created this single worksheet view. Step 1: Add Date to the Columns shelf as a continuous dimension and choose Exact Date, add Stock to the Rows shelf, and add Volume to the Rows shelf. Step 2: Hide the header for the Date axis and make the Volume axes independent NOT starting at zero. Step 3: Create calculated fields to determine which dates are in the most recent week and which dates are in the prior week. Note that the table calculations compute along Date. Step 4: Create calculated fields to get the volume for the latest week and prior week. Note that the table calculations compute along Date. Step 5: Create calculated fields for the week over week change and percent change. 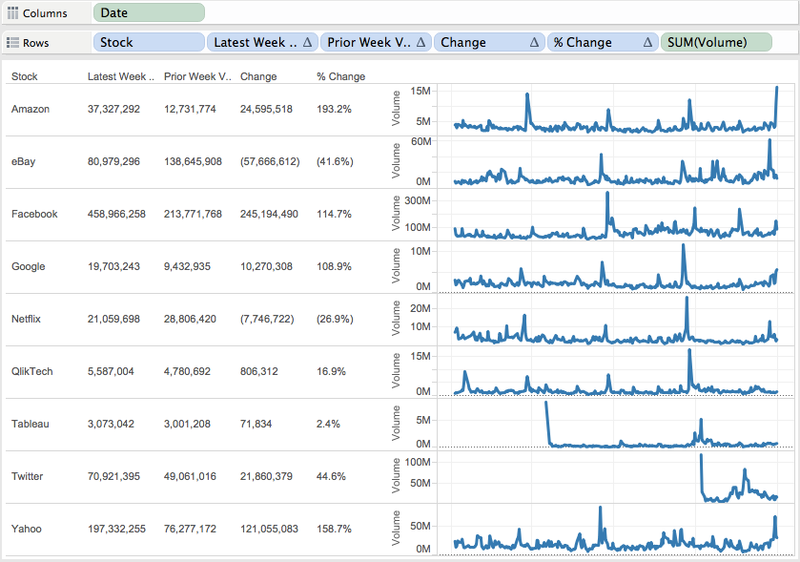 Step 6: Add Latest Week Volume, Prior Week Volume, Change and % Change to the Rows shelf and then convert them all to discrete. This will make them appear as columns of data. Reorder these discrete measures as you see fit. Step 7: I like to include an indicator on the end of my sparklines (see this blog post). I do this by creating a calculated field to get the value for the latest date and then add it as the secondary axis. I then color it by the % change. Step 8: Create a calculated field to filter to the last 30 days, add it to the filters shelf and choose True. Step 9: Clean up and formatting. I removed the gridlines, removed the lines for the column divider pane, hid the header for Volume, changed the worksheet font size, right justified the discrete measures on the Rows shelf, narrowed the width of the sparklines, made the sparklines thinner, made the headers bold, and bottom aligned the headers. Step 10: I created a dummy header for my sparklines that shows the "as of date" and added it to the Columns shelf. 2) Create a calculated field that returns the negative of the value chosen in the parameter. I add the negative for a sort descending effect. 3) Convert the field to discrete, add it as the first pill on the Rows shelf, then hide the header to hide the field. This doesn't take very long once you do it a time or two. Give it a shot! Download the workbook here. I might to steal this and try using it for some or our data. Good way of showing both detail and high level in the same view. Nicely done, Andy. Lots of subtle goodness here. As for stealing, I have always told my colleagues and students that in the Tableau Community it is not about Copy and Steal Everything, but rather, Collaborate and Share Everything that makes the community so virtuous. I have 5 rows of data coming from different tables/different extract and it is a MOM calculation. So near to each I have to display an arrow showing where it is up or down. Can anyone help me with this. Each row is not the same measure but different. I can try to help if you post a link to a sample workbook or email it to me. Otherwise, try the forums. Thank you for this, it is very helpful. How would you add a column that is percent of total for the Latest Total Volume column? Can you please make this workbook available again? The link is broken. Thanks; very helpful. The link is correct. 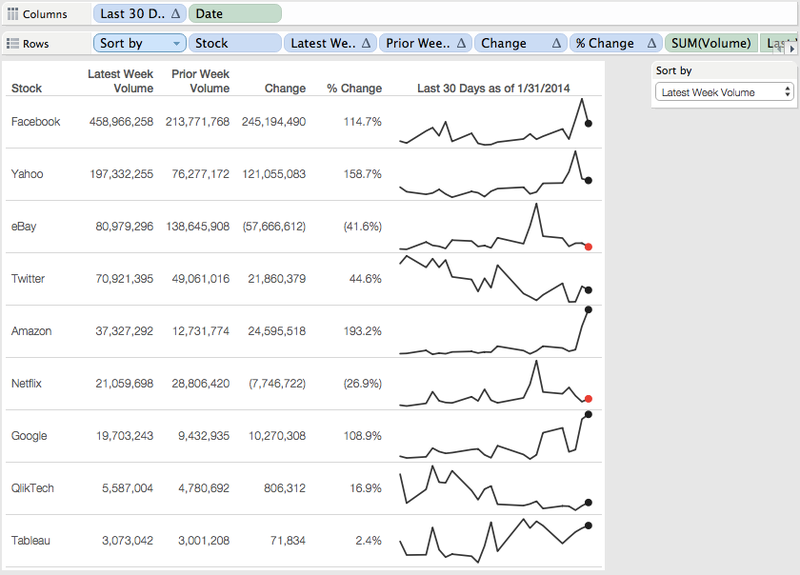 If that doesn't work for you, you can always download it via the Download button on the Tableau Public viz at the top. Instead of last week, I want to display last month. How do I change the calculated field to last month. My date dimensions is shown as January 2014, February 2014, etc. through January 2015. Can you help? Thank you. If you're date is at the monthly level, then the calc you have above won't work. You need to change it to month instead of day. The prior week calculated field appears cut off at the end so it's not viewable. Are you able to provide the entire formula? Thank you. Download the workbook at the link provided and you can see the formula. Great tip. One question as I'm stuck on implementing a variation based on getting previous week to be from say Sun - Sat vs the rolling 7 days you show here. Everything I've tried (max/datepart/week) in several variations which doesn't seem to calculate correctly. Do you have a quick idea/solution to this? N/m Andy figured it out. Used the table calc window_sum with a datetrunc and dateadd to find last week and previous week. hi Daniel, can you post your solution using datetrunc and dateadd? Researching more on spark lines via google, ran across this post, and wanted to help simplify one of the calcs that I had time to take a look at. --Only looked at this one calc in the blog. Again I rather enjoy the complexity added here, but it appears unnecessary given Tableau's flexibility with last(). Stepping away from 6 functions to give a single circle and increasing the performance of the viz/dashboard, which also gives you a quick and easy to support calc. [Measure] can be a measure swap calculated field and complexity of sum/avg/max/etc can be added in that calculated field. Thanks for the tip Tyler!! This is amazing step by step guide! But I really want to adjust a little bit: I want to paint numbers in green/red despite on value positive or negative, is it possible in easy way? Since the numbers in the table are dimensions, you can't do that easily. There are a few very complicated workarounds. You should typically avoid red/green as well since they're not colour-blind friendly. Andy, is it difficult to share this information? What are you trying to share? Thank you for this great post. What modification can you recommend, if I am trying to take a unique count of users in a given time period (eg - last week). I am trying to follow your guidelines to reproduce this on a project I am working on. My issue is that instead of summing up the volume as you have done, I am trying to take unique count of users for a given time period. Although I can calculate the unique users and throw it in the view, I am unable to reproduce in a manner which displays both the sparkline and the numerical value in one row. Shanti, I would encourage you to download the workbook and dissect how I did it. From there, you'll figure it out for your specific case. 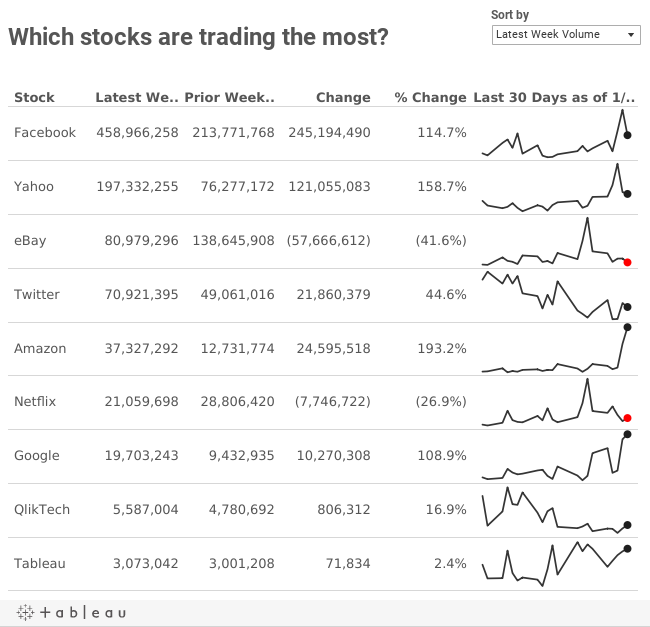 Hey Andy, is there a way to show the same last week data for all Stocks if there is missing data for one of the stocks? And then to add a rank # column to the left of the "Stock" dimension column? 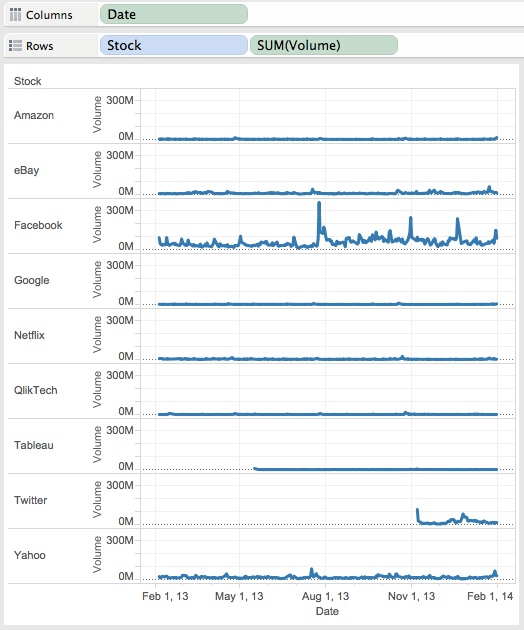 What I mean to say is, let's say you did not have data for just Amazon from 1/26/14 and onwards. Using the existing code, you would end up showing the data for the week of 1/19/14-1/25/14 for Amazon instead of zero. Yes, you can do that using the lookup function. Thanks for the quick reply Andy! It's much appreciated. I'm still confused though--I had previously been looking into using INDEX() to create a rank column but have not had much success (the calculated field I created when placed on the rows shelf either ranks correctly but does not sort in sequence or ranks incorrectly but in sequence). Is there some way to combine the LOOKUP() function with INDEX() to create the rank column sorted by latest week volume? Daniel, it would be easier for me to help if you posted a link to a packaged workbook that contains an example the problem. This way I can look at how you're built your calculations. The modifications I made to the underlying dataset are: (1) Removal of the last week of data for Amazon and (2) An additional column with the number of shares purchased on the corresponding day. The "Rank" field is simply a calculated field using INDEX() and calculated using the "Table (down)" setting. I am new to tableau and am mesmerized your dashboard skills and Awesome work that you do to help us all with good dashboards that we can use in our day to day life. Hi andy , I am a new tableau user but i feel lost in an ocean when learning tableau . Could you please write a post that provides some direction for new rookies to follow while learning tableau . Regards , Vishal . 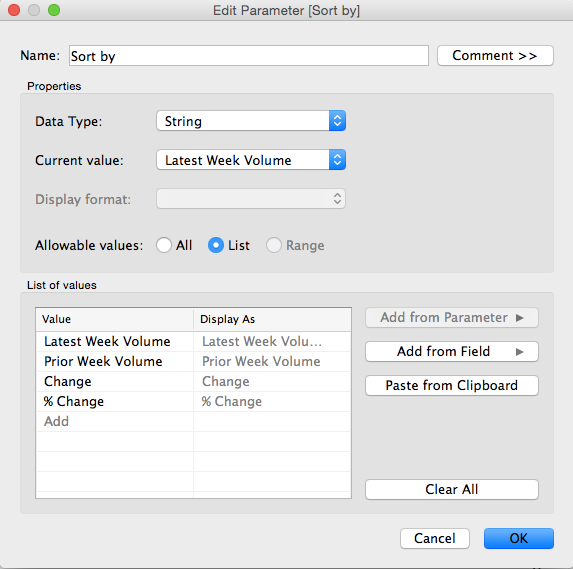 How can the 'Latest week volume' and 'Prior week volume' columns be made flexible with parameter where users can enter a range of dates (up to a month period)? The calculations in this post could easily be changed to use parameters instead. For example, in the Last Week calculation, you would change the 6 to the parameter instead. Rinse and repeat for the other calculations. This seems to be working but would appreciate your feedback. 2) The remaining issue I have is that not all dimensions have a max(record) that falls under the same week. So for dimension A, my max(date) is 1/3 (a Sunday) and for dimension B, my max(date) is 1/9 (the following Saturday). So what I get then is 2 different weeks falling under my Last 30 day header and it also messes up my Last Day colored spark dot. I replaced the calculation above with a parameter to set the Saturday date I was wanting and replaced all the references back to that parameter value, which appears to be working from what I am seeing. Do you see any issues with that solution? Makes sense to me Jonathan. Thanks Andy! I have one last question. 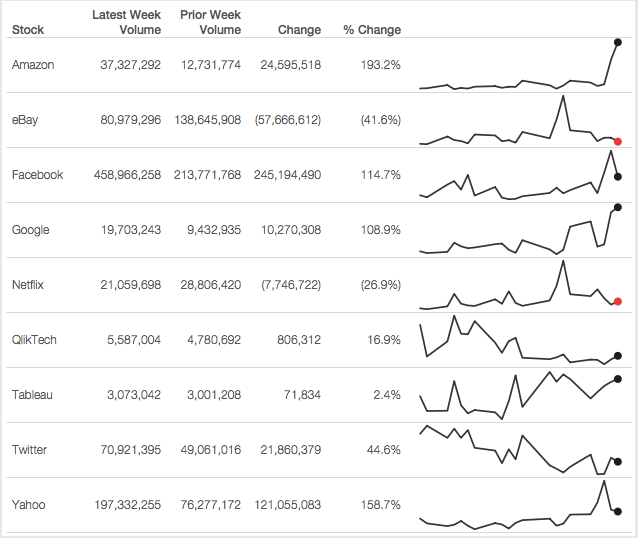 I have a ton of dimensions and ideally I could just filter by the top 3 movers (week over week difference) for a dashboard. I'm running into issues with a Top N filter I assume because there are table calculations involved. Is there a good way to work around this? The easiest way to get around it is to put the table calc as a dimension as the first column in your view (assuming the data goes down the table), then add an index table calc as have it filter to the first 3. There are probably simpler workarounds. Just search the forums and I bet you'll find something. 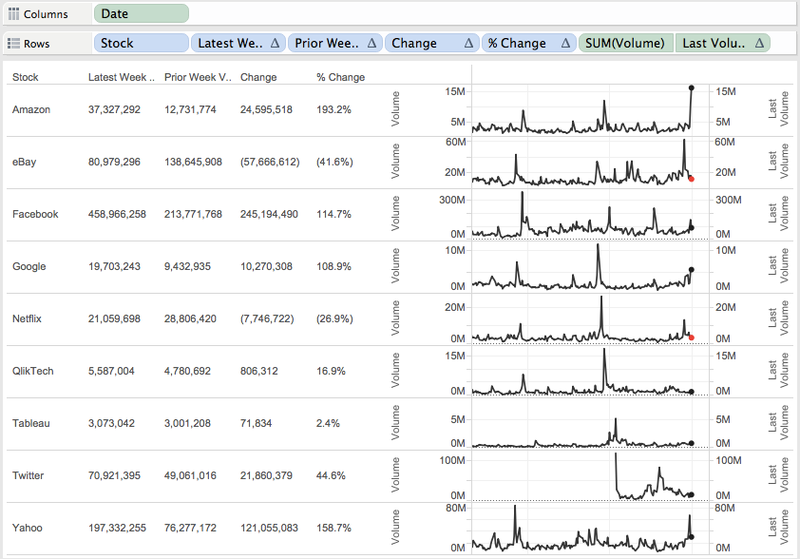 I'm trying to create something exactly like this post (e.g., summary of the overall KPI, and a sparkline over last 30 days), except where the example in this post has the %age Change value I'd like to display an Up or Down arrow depending on whether the change is positive or negative. I'm trying to do this all on one sheet, rather than creating a dashboard of multiple sheets. Is this feasible? Any help welcome. Thank you for this helpful post! I followed it and it works great. 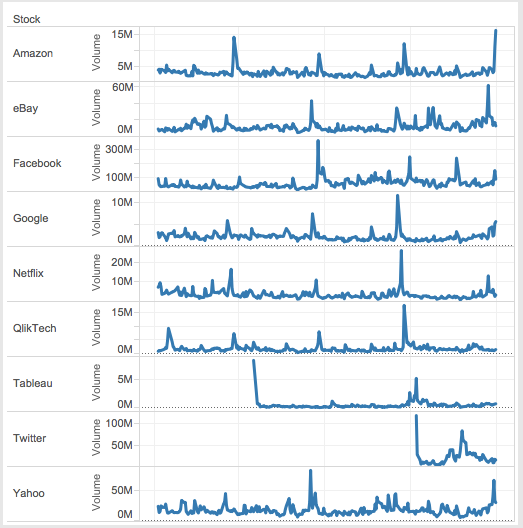 One question though - how would you now show only the top 5 performing stocks? You can create a RANK calculation and filter to 1-5.
what isthis 6 ,can you explain on this calculation. The calculation starts at 0, so this calcs accounts for 7 days 0,1,2,3,4,5,6 where 0=latest day. and what does it retireve and total(max(date) is 31 right ? Me telling you isn't going to help your development. Download the workbook and reverse engineer it. That's the only way you'll truly learn how these table calcs work. I was wondering how you could implement conditional formatting on the "change" columns? so that the bigger the change, the stronger the shading color. The change columns are discrete, so you can't color them. However, if you want to color the dot on the end of the line as a gradual shading, use the calculation from Step 5 on the color shelf. What if there are different KPIs like a Volume, revenue and stuff in retail...how do you show them in a similar chart? For the Last week calculation, what is the reason for including the lookup in addition to the window_sum? It might be totally unnecessary. It's how I did the calc in my head so I went with it and it worked. 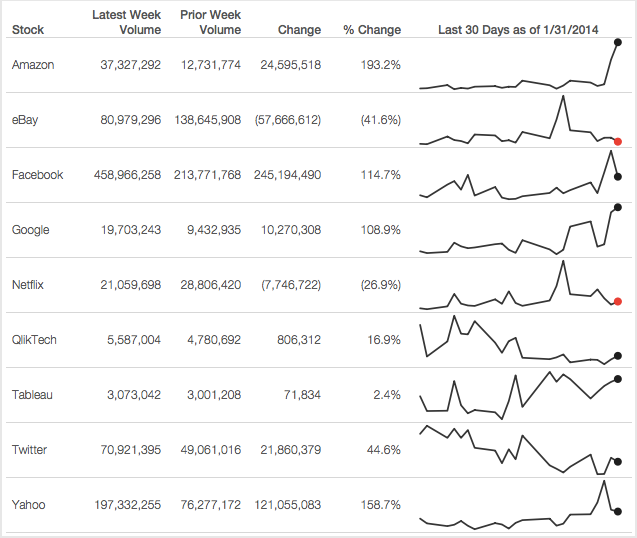 There are always lots of ways to get to the same result in Tableau. I am beginner and recently started tableau. I found your videos are very much interesting. Please can you tell me where I can find data set to work on ? i have replicated the same for one of my assignment, on top of it i would like to see Top and Bottom X records, i have used unique-rank function and dropped it just right to sort field and left to stock, but then the view is splitting up differently for different computations & unable to get the exact row numbers. i have noted that this happen when the date field is in continuous exact day level only..
kindly extend this topic and help to find solution for my query..